This is the mechanism by which I conceive that, unless credit expansion is continued progressively, an inflation-fed boom must sooner or later be reversed by a decline in investment. This theory never claimed to do more than account for the upper turning point of the typical nineteenth–century business cycle. The cumulative process of contraction likely to set in once unemployment appears in the capital-goods industries is another matter which must be analyzed by conventional means. It has always been an open question to me as to how long a process of continued inflation, not checked by a built-in limit on the supply of money and credit, could effectively maintain investment above the volume justified by the voluntary rate of savings. It may well be that this inevitable check only comes when inflation becomes so rampant – as the progressively higher rate of inflation required to maintain a given volume of investment must make it sooner or later – that money ceases to be an adequate accounting basis. The built-in limit on the supply of money to which Hayek referred was the gold standard, manifesting itself in a tendency for monetary expansion to cause both an external and an internal drain on the gold reserves of the monetary authority. In a fiat-money system with a flexible exchange rate, no such limit on the supply of money exists. So according to Hayek, at some point, the monetary authority is faced with a choice of either increasing the rate of inflation to keep investment at its artificially high level or allowing investment to decline, triggering a recession. That is the upper turning point of the cycle. But he also says “the cumulative process of contraction like to set in once unemployment appear in the capital-goods industries is another matter which must be analyzed by conventional means.” I take this to mean that, according to Hayek, the monetary authority can limit the cumulative process of contraction that results when the current rate of inflation is fully anticipated and monetary expansion is not increased to accelerate inflation to a higher, as yet unanticipated, level. There is thus a recession associated with the stabilization of inflation, but monetary policy can prevent it from becoming cumulative. After the real adjustment takes place and the capital goods industry Is downsized, a steady rate of inflation can be maintained, with no further real misallocations. There is inflation, but no boom and recession. In other words, it’s the Great Moderation. Hayek called it in 1969. So, what is neoclassical economics? There’s a historical definition, having to do with the “marginal revolution” of the late 19th century and all that, but what I think we mean in practice is economics based on maximization-with-equilibrium. We imagine an economy consisting of rational, self-interested players, and suppose that economic outcomes reflect a situation in which each player is doing the best he, she, or it can given the actions of all the other players. If nobody has market power, this comes down to the textbook picture of perfectly competitive markets with all the marginal whatevers equal. [A]s the general thesis of what I have called the “Ricardo Effect” may not now be familiar to all readers, I shall first restate it in a which, though not wholly unobjectionable, I have often found to more readily intelligible than the more precise statement I have given on earlier occasions. The theorem called the Ricardo Effect asserts that in conditions of full employment an increase in the demand for consumer goods will produce a decrease of investment, and vice versa. The manner in which this result is produced can be conveniently represented in a diagram corresponding to the familiar representations of the production function. In this diagram, however, the total stock (fixed and circulating) of capital is measure, on the abscissa; and the total stream [aka flow] of input, including all that is required to maintain the stock of capital at the level most profitable in the circumstances, is measured on the ordinate. We shall assume for the present purposes that this production function is linear and homogeneous. Since the magnitudes represented along the two co-ordinates both consist of variable combinations of heterogeneous goods and services, these can of course be represented in value terms. This would be strictly legitimate only if we could assume that the prices of the various goods and services involved remain constant. In fact, however, the changes which we will consider necessarily involve some changes in the relation between these prices. Hence the slightly unsatisfactory nature of the technique, to which I have referred before, derives. It seems to me, however, that this defect does not seriously detract from the validity of the conclusions which can be derived in a comparatively simply manner by these methods. Readers who wish to see a more exact demonstration will have to refer to my 1942 article. But for the present purposes, I trust that this simplified exposition will suffice. I have long found it effective in teaching, but because of this defect, have refrained from putting it into print. For another example of Hayek’s neoclassicism see volume 2 of Law Legislation and Liberty, pp. 117-19. It would be tedious to reproduce the whole passage here. But it is worth reading just to see how Hayek deployed standard neoclassical production theory in an elegant and compact exposition of the theory of general equilibrium and Pareto-optimality. In a long and productive scholarly career, F. A. Hayek worked for the most part in relative obscurity. That obscurity was interrupted by three, maybe four, short periods when his fame extended beyond his fellow economists to a wider public. The first was in the early 1930s when, arriving in London in the depths of the Great Depression, he became, while still a young man, the second most famous economist — surpassed only by Keynes himself — in Britain. Next, at the end of World War II, in middle age, he achieved international celebrity when his book The Road to Serfdom became a surprise best-seller. Then, in his old age, to the surprise of almost everyone, Hayek was awarded the 1974 Nobel Prize in economics. Finally, when he was almost 90, Hayek enjoyed a final moment of glory after the Soviet empire imploded in the late 1980s, providing ultimate vindication for his argument, advanced almost six decades earlier, but widely dismissed and mocked by many economists who should have known better, that comprehensive central planning was ultimately an unworkable system for running a modern economy. Now, once again, some 20 years after his death, Hayek seems to be enjoying another of his periodic bursts of fame — this time because the presumptive Republican nominee for Vice-President of the United States, Paul Ryan, likes to cite Hayek as one of his intellectual inspirations, offering Hayek as an alternative source for his ideological position to Ayn Rand, whom Ryan had to throw overboard because of her militant atheism, Hayek’s discreet agnosticism apparently not (yet?) making him untouchable. Hayek’s renewed celebrity earned him the dubious honor of being written about in the New York Times Magazine by Adam Davidson, a financial journalist for Planet Money, and a columnist for the New York Times Magazine. Davidson does not get off to a good start, calling Hayek “an awkwardly shy (and largely ignored) economist and philosopher who died in 1992.” Hayek did die in 1992, and he was an economist and a philosopher, but to say that Hayek was “largely ignored” is a curious way to describe a Nobel Prize winner, even if one makes due allowance for the surprise with which the award of the Nobel Prize to Hayek was met. That was bad enough, but to call Hayek “awkwardly shy” is sheer fiction, and not just fiction, but an absurd fiction. I have never seen Hayek described by anyone as shy. And in my intermittent acquaintance with Hayek, over almost 20 years from the time I met and took classes from Hayek as an undergraduate student when he visited UCLA in the 1968-69 academic year, I never observed an awkward moment. Hayek to be sure evidenced a certain reserve, but it was the courtly, aristocratic reserve of the Viennese haute bourgeoisie, the “von,” which Hayek dropped from his surname upon becoming a British subject in the 1930s, marking the elitist background from which Hayek sprang. Among his family connections were his cousins Ludwig Wittgenstein, the philosopher and Paul Wittgenstein, the concert pianist, who, after losing his right arm in World War I, commissioned Maurice Ravel to compose his Concerto for the Left Hand. The Wittgensteins’ father, Karl, was perhaps the wealthiest industrialist in Austria. After a preposterous start like that, nothing that Davidson says about Hayek can carry any credibility. Here Davidson doesn’t just get Hayek wrong, he gets everything wrong. Where to start? “For the past century, nearly every economic theory in the world has emerged from a broad tradition known as neoclassical economics.” Fair enough, though the dominance of neoclassical economics probably goes back to at least 1880, and certainly no later than the publication of Alfred Marshall’s Principles of Economics in 1890, 120 years ago. But what can Davidson possibly mean by the bizarre parenthetical side comment “even communism can be seen as a neoclassical critique?” Does he mean that communism is a version of neoclassical economics? Or perhaps he means that Communism is a critique of neoclassical economics. Either alternative would be truly amazing if, by Communism, he means the economic doctrines of Karl Marx, doctrines Marx had developed well before the principal founders of neoclassical economics, William Stanley Jevons, Carl Menger and Leon Walras, published their versions of the marginal utility theory of value in the early 1870s. Perhaps Davidson means something else by Communism, but for the life of me, I can’t imagine what it might be. Then, paying no attention to the theoretical content of neoclassical theory, Davidson identifies the set of crucial core beliefs of neoclassical economics as follows: “it is useful to look for government policies that can improve the economy.” The mind boggles. This is not just cluelessness; it’s cluelessness masquerading as profundity. In actuality, Ryan is like a lot of politicians who merely cherry-pick Hayek to promote neoclassical policies, says Peter Boettke, an economist at George Mason University and editor of The Review of Austrian Economics. Does Davidson know what a neoclassical policy is? Does Boettke? Does anyone? I don’t think so, because neoclassical economics, as such, has no policy agenda. But whatever a neoclassical policy might be, Davidson assures us that Hayek is totally against it. Now, although the term “neoclassical policy” is a pure nonsense term, I can guess how Davidson, after talking to a bunch of Austrians — I hope not Boetkke or Bruce Caldwell, who is also quoted in Davidson’s piece — picked up on the propensity of modern self-styled Austrians — generally followers of the fanatical Murray Rothbard, as distinguished from the authentic Austrians of Hayek’s generation — to deploy “neoclassical” as a term of abuse, providing sufficient justification for these modern Austrians to dismiss any economic doctrine or policy they don’t like by strategically applying the epithet “neoclassical” to it. So let me assert flatly that F. A. Hayek was a neoclassical economist through and through. He was also an authentic Austrian economist, schooled in both branches of Austrian theory by way of his association with his primary teacher at the University of Vienna, Friedrich von Weiser Wieser, one of the two principal successors of Carl Menger, the founder of the Austrian School, and through his subsequent collaboration with Ludwig von Mises, a leading student of Eugen von Bohm-Bawerk, the other principal successor of Menger. In an introductory essay (“The Place of Menger’s Grundsatze in the History of Economic Thought”) to a volume, Carl Menger and the Austrian Theory of Value, edited by J. R. Hicks, commemorating the centenary of Menger’s classic work Grundsatze der Volkwirtschaftslehre (Principles of Economics) propounding the marginal-utility theory of value, Hayek explained that Menger’s theory had been incorporated into the larger body of economic theory that grew from the foundational contributions of Jevons, Menger, and Walras. While Menger’s work had become less influential in the second half century following publication of Menger’s Grundsatze than it had been in the first half-century after its publication, Hayek attributed that fact to a shift, under the influence of Keynes, in the interests of economists from micro- to macro-economics. Keynes’s work was not neoclassical economics, and it has been an ongoing project ever since Keynes published the General Theory to determine whether, and to what extent, Keynes’s theory could be reconciled with neoclassical economic theory. Here is how Hayek summed up his essay. It seems to me that signs can already be discerned of a revival of interest in the kind of theory that reached its first high point a generation ago – at the end of the period during which Menger’s influence had mainly been felt. His ideas had by then, of course, ceased to be the property of a distinct Austrian School but had become merged in a common body of theory which was taught in most parts of the world. But though there is no longer a distinct Austrian School, I believe there is still a distinct Austrian tradition form which we may hope for many further contributions to the future development of economic theory. The fertility of its approach is by no means exhausted and there are still a number of tasks to which it can profitably be applied. So we are all (or almost all) neoclassical economists, and none more so than Hayek, who was steeped in the neoclassical tradition. But no tradition is static. When a tradition stops changing, when it stops evolving, it becomes a relic, not a tradition. And with change come differences of opinion and disagreements, even bitter disagreements, between practitioners operating within a single broad tradition. Many Austrians now view themselves as completely distinct and separate from the broader neoclassical tradition from which their own doctrines evolved, but that was never Hayek’s view. And for all the severe criticisms and complaints he voiced about the direction of economics since the 1930s, he never viewed himself as being cut off, or alienated, from the mainstream of neoclassical economic theory. That Hayek could be both a critic and a practitioner of neoclassical economics is obviously too complicated a proposition for Mr. Davidson, and many others for that matter, to comprehend, but to Hayek it seemed entirely natural and unremarkable. By intangible infrastructural capital, I mean knowledge about other people acquired by individuals in the course of their daily lives when interacting with, and relating to, other people, even superficially, within the different sorts of communities to which they belong. The concept of intangible infrastructural capital could properly be expanded to include language and law and traditions of various kinds, but for purposes of this post, I prefer to focus chiefly on a narrow subset of the entire class of knowledge that might fit into the category. By knowledge, I don’t mean factual or scientific knowledge, I mean expectations about what people will do or how they will react under a variety of conditions or circumstances. I call this knowledge capital, because almost all knowledge has some value and usefulness, and this knowledge is acquired only through the expenditure of some effort, even when the knowledge is acquired more or less incidentally in the course of actions that people take or activities in which they engage that bring them into contact — regular contact — with other people. Thus, the assets are acquired and maintained only by way of some minimal investment of time and effort to form such relationships, however superficial. The assets are intangible, because the assets are almost never embodied in physical form, rather existing only in the minds and memories of individuals, available for use when particular circumstances make that knowledge useful. The assets are infrastructural, because, like physical infrastructure – roads, public utilities and the like — they create an environment in which people are able to pursue their own interests and formulate and execute their own plans to advance those interests. The individual pieces of knowledge are more meaningful and useful in the aggregate than they are considered as separate bits of information, because the aggregate of knowledge helps people coordinate expectations in a way that allows their lives to be conducted on the basis of shared mutually consistent expectations about how each other will behave. A well-used city street is apt to be a safe street. A deserted city street is apt to be unsafe. But how does this work, really? And what makes a city street well used or shunned? . . .
First, there must be a clear demarcation between what is public space and what is private space. Public and private spaces cannot ooze into each other as they do typically in suburban setting or in projects. Second, there must be eyes upon the street, eyes belonging to those we might call the natural proprietors of the street. The buildings on a street equipped to handle strangers and to insure the safety of both residents and strangers, must be oriented to the street. They cannot turn their backs or blank sides on it and leave it behind. And third, the sidewalk must have users on it fairly continuously, both to add to the number of effective eyes on the street and to induce people in buildings along the street to watch the sidewalks in sufficient numbers. Nobody enjoys sitting on a stoop or looking out a window at an empty street. Almost nobody does such a thing. Large numbers of people entertain themselves, off and on, by watching street activity. In settlements that are smaller and simpler than big cities, controls on acceptable public behavior, if not on crime, seem to operate with greater or lesser success through a web of reputation, gossip, approval, disapproval and sanctions, all of which are powerful if people know each other and word travels. But a city’s streets, which must control not only the behavior of the people of the city but also of visitors from suburbs and towns who want to have a big time away from the gossip and sanctions at home, have to operate by more direct straightforward methods. It is a wonder cities have solved such an inherently difficult problem at all. And yet in many streets they do it magnificently. As I watched from our second-floor window, making up my mind how to intervene if it seemed advisable, I saw it was not going to be necessary. From the butcher shop beneath the tenements had emerged a woman who, with her husband, runs the shop; she was standing within earshot of the man, her arms folded and a look of determination on her face. Joe Corncchia, who with his sons-in-law keeps the delicatessen, emerged about the same moment and stood solidly to the other side. Several heads poked out of the tenement windows above, one was withdrawn quickly and its owner reappeared a moment later in the doorway behind the man. Two men from the bar next to the butcher shop came to the doorway and waited. On my side of the street, I saw that the locksmith, the fruit man and the laundry proprietor had all come out of their shops and that the scene was also being surveyed from a number of windows besides ours. That man did not know it, but he was surrounded. Nobody was going to allow a little girl to be dragged off, even if nobody knew who she was. I am sorry – sorry purely for dramatic purposes – to have to report that the little girl turned out to be the man’s daughter. For large collections of, mostly anonymous, individuals to interact with reasonable expectations of personal safety, those individuals must hold confident expectations of safety, expectations supported by the knowledge that they will be visible to others who could help them should they be endangered. That is why cities and urban neighborhoods thrive when there is a lot pedestrian traffic and decay when that traffic dwindles. People feel safe when they can walk in places where a lot of other people are walking or watching. Jacobs became the scourge of urban planners and advocates of urban renewals who wanted to create planned self-contained residential communities without that healthy organic mix of small business and shops and high density residences that draw people onto the streets, infusing those neighborhoods with an energy absent from monotonous planned single-use communities. High population density is an important condition that allows neighborhoods to achieve the vibrancy of diverse mutually supporting activities. Jacobs justly became a famous, almost legendary, public figure through her epic battles with the ultra-powerful, seemingly invincible, urban planner and infrastructure builder, Robert Moses, who wanted to decimate Jacobs’s beloved Greenwich Village community, turning it into an urban renewal project while running a super highway through lower Manhattan. The magnitude of Jacobs’s achievement in standing up to, and ultimately thwarting, Moses’s designs on her neighborhood, stopping the juggernaut in its tracks, is memorably described in Robert Caro’s monumental, award-winning biography of Robert Moses, The Power Broker: Robert Moses and the Fall of New York. While the devastating implications of what Robert Moses wanted to do to lower Manhattan in 1960 are now widely acknowledged, it seems to me that we still have not arrived anywhere near a proper understanding of the scale of destruction inflicted on communities, both urban and rural, by the interstate-highway system, still widely regarded as one of the great achievements of the federal government in the second half of the twentieth century, perhaps the chief domestic achievement of Eisenhower administration, and often cited as a model by contemporary advocates of physical infrastructural investment. The massive interstate highways, cutting through every major urban center in the country, destroyed countless urban neighborhoods and communities, uprooting many hundreds of thousands of residents, and forcing thousands of small businesses out of existence. Beyond those direct effects, there were much wider indirect effects, the new highways not just destroying the structures in their direct paths, but interrupting and disrupting the previous patterns of pedestrian and vehicular traffic on the city streets they dismembered, thereby rendering nearby businesses and communities not directly swallowed up by the highways economically unsustainable. The destruction of those neighborhoods and communities, disproportionately occupied by minorities and low-income families, often herded into newly constructed, large-scale, utterly dysfunctional, urban-renewal projects, had devastating consequences on residents, contributing to and exacerbating the social pathologies associated with the breakdown of formerly stable communities. Even in the big cities, where the “web[s] of reputation, gossip, approval, disapproval and sanctions, all of which are powerful if people know each other and word travels” are less constricting than those in small towns, those informal social controls are not entirely absent or ineffective. The destruction of communities and neighborhoods by interstate highways cutting right through them meant the annihilation of the intangible infrastructural capital by which basic standards of acceptable conduct could be transmitted to, and enforced upon, young people, or at least some of them, some of the time. The collapse of communities meant a collapse of standards. The construction of new physical infrastructure led directly to the destruction of a much more valuable intangible infrastructure of social standards and restraints on anti-social conduct. I also conjecture that the construction of interstate highways spelled doom for many rural communities dependent on traffic flows along, or connected to, the formerly well-traveled highways bypassed by the new interstates, contributing to and accelerating the migration of young people from rural areas and small towns to major metropolitan areas, again causing a breakdown in the restraints on anti-social conduct. It was also the interstate-highway system that enabled Walmart to achieve rapid growth in sales by locating its new stores very close to major interstates, which gave the new stores a huge advantage over their small local competitors off the interstate-highway system, competitors less accessible both to customers and to the large trucks delivering merchandise from wholesalers and manufacturers. Little by little the economic vitality of small communities off the interstate-highway system was drained out of them, causing many of those communities to wither and shrivel up. In the case of Walmart, at any rate, President Obama’s now infamous remark “you didn’t build that” was eminently justified. Of course, the irony and tragedy is that it actually was built. Would that it weren’t! This post is not meant to as an attack on investing in tangible infrastructure. I actually think that the return on many kinds of physical infrastructure is pretty high. But we ought to be more aware than we seem to be of the disastrous consequences that the construction of the interstate-highway system had on individuals, families, neighborhoods, communities, towns and cities, all across the country. And we should at least be somewhat mindful of the risks that future large-scale investments in physical infrastructure could have similarly unfortunate unintended consequences. Free exchange, the economics column in the Economist, has a really interesting piece in this week’s issue on two theories of the origin of money. The first theory is the evolutionary market theory propounded by Carl Menger, one of the three independent and simultaneous co-discoverers of the marginal utility theory of value in the early 1870s, (the two co-discoverers being William Stanley Jevons and Leon Walras) in a classic 1892 paper “On the Origins of Money,” and the other being the Cartalist theory, famously advanced by G. F. Knapp in his State Theory of Money, but also by other more orthodox theorists like P. H. Wicksteed (see my earlier posts here and here), and more recently in a paper by Charles Goodhart, discover of Goodhart’s Law, an only slightly less general statement of what came to be known some years later as the Lucas Critique. Menger’s theory is a brilliant conjectural history of how money might have evolved as the result of individual choices by individuals seeking to reduce their transactions costs in an economic environment that is changing from subsistence farming into a market economy characterized by specialization. Some individuals, realizing that certain commodities were easier to trade than others, would begin holding inventories of those goods beyond their immediate demands, thereby enhancing their ability to find trading partners. But by holding inventories of those commodities, these alert individuals would do two things, first they would make it even easier to trade in those commodities, and second they would induce other people to follow their example. As others followed their example, the costs of trading in those commodities originally identified as low cost commodities to trade would be reduced still more. This was an early description of what have recently come to be known as network effects or network externalities. A good characterized by a network effect is a good for which the demand increases as more people demand it. Menger beautifully described the process by which a commodity would emerge as money owing to the network effects inherent in being used as a medium of exchange. Take the widespread use of precious metals as money. A Mengerian would say that this happens because metals are durable, divisible and portable: that makes them an ideal medium of exchange. But it is incredibly hard to value raw metals, Mr Goodhart argued, so the cost of using them in trade is high. It is much easier to assess the value of a bag of salt or a cow than a lump of metal. Raw metals fail Menger’s own saleableness test. My interpretation of Roman history (I am afraid that I must plead ignorance about Japanese history) is a bit different. The overthrow of Rome was largely the work of the Arab conquests of the seventh and eighth centuries. Henri Pirenne in his wonderful book Mohammed and Charlemagne argued that the Arab conquests of most of the Mediterranean sea ports essentially cut off the long-distance Mediterranean trade of the remnants of Western Roman empire. The closing off of export markets and the corresponding loss of imported goods caused a regression from specialization and trade back to autarchy. As foreign trade collapsed, local economies became increasingly self-sufficient and the demand for money dropped correspondingly. Reversion to barter was not occasioned by the absence of a state that provided coinage, but by the collapse of an exchange economy that created the demand for coinage. So I don’t see the conflict between the Mengerian theory and Cartalist theory as being as sharp as Goodhart and Free exchange seem to suggest. On the other hand, the 1998 paper by Goodhart was remarkably prescient in describing the kinds of problems that have beset the euro, problems closely associated with “unprecedented divorce between the main monetary and fiscal authorities” in charge of conducting policy for the Eurozone. The topic is far from exhausted, but I am. Perhaps I will have more to say on subject in a future post. Where Does Paul Ryan Go When He Thinks About Monetary Policy? If you don’t already know the answer to that question, you haven’t been paying attention since Mitt Romney chose Ryan to be his running mate on the GOP ticket. But I have. Well, not really, but I did stumble across a piece by David Wiegel today in Slate. My jaw is still out of position after that experience. Congressman Ryan apparently does not know that although Rand admired Mises, she loathed and detested Hayek as a compromiser. David Wiegel delved into Ryan’s speech to the Atlas Society and found this mind-boggling passage (which I quote in slightly more detail than Wiegel). So there you have it; this is where Paul Ryan goes to think about monetary policy. Let’s read it again: “Destroyers seize gold and leave to its owners a counterfeit pile of paper. . . . Gold was an objective value, an equivalent of wealth produced. Paper is a mortgage on wealth that does not exist, backed by a gun aimed at those who are expected to produce it. Paper is a check drawn by legal looters upon an account which is not theirs.” OMG! Jack Kemp, for whom Paul Ryan worked when he started his career, had what, at the time, seemed like a merely eccentric obsession with gold, expending a great deal of his considerable political energy and capital in futile attempts over at least two decades to stir up interest in restoring the gold standard. Apparently he was also an admirer of Ayn Rand. Thanks to David Weigel, we now know that the inspiration for a fetishistic obsession with gold may just be Francisco d’Anconia’s speech at Bill Taggart’s wedding in Atlas Shrugged. Paul Ryan has been somewhat more circumspect than his mentor, Jack Kemp, in prostelytizing on behalf of the gold standard. But now we know where his head is. And we know the source — the fountainhead — for his “thinking” on monetary policy. He said so himself. Thank you, Congressman Ryan, for sharing. In my two previous installments on Earl Thompson’s reformulation of macroeconomic theory (here and here), I have described the paradigm shift from the Keynesian model to Thompson’s reformulation — the explicit modeling of the second factor of production needed to account for a declining marginal product of labor, and the substitution of a factor-market equilibrium condition for equality between savings and investment to solve the model. I have also explained how the Hicksian concept of temporary equilibrium could be used to reconcile market clearing with involuntary Keynesian unemployment by way of incorrect expectations of future wages by workers occasioned by incorrect expectations of the current (unobservable) price level. In this installment I provide details of how Thompson solved his macroeconomic model in terms of equilibrium in two factor markets instead of equality between savings and investment. The model consists of four markets: a market for output (C – a capital/consumption good), labor (L), capital services (K), and money (M). Each market has its own price: the price of output is P; the price of labor services is W; the price of capital services is R; the price of money, which serves as numeraire, is unity. Walras’s Law allows exclusion of one of these markets, and in the neoclassical spirit of the model, the excluded market is the one for output, i.e., the market characterized by the Keynesian expenditure functions. The model is solved by setting three excess demand functions equal to zero: the excess demand for capital services, XK, the excess demand for labor services, XL, and the excess demand for money, XM. The excess demands all depend on W, P, and R, so the solution determines an equilibrium wage rate, an equilibrium rental rate for capital services, and an equilibrium price level for output. In contrast, the standard Keynesian model includes a bond market instead of a market for capital services. The excluded market is the bond market, with equilibrium determined by setting the excess demands for labor services, for output, and for money equal to zero. The market for output is analyzed in terms of the Keynesian expenditure functions for household consumption and business investment, reflected in the savings-equals-investment equilibrium condition. R = P times MPK. The excess demand for labor can similarly be represented by the condition that the reservation wage at which workers are willing to accept employment equals the value of the marginal product of labor given the inherited stock of capital K*. As I explained in the previous installment, this condition allows for the possibility of Keynesian involuntary unemployment when wage expectations by workers are overly optimistic. r = R/P + (Pe – P)/P), where Pe is the expected price level in the next period. Because K* is assumed to be fully employed with a positive marginal product, a given value of P determines a unique corresponding equilibrium value of L, the supply of labor services being upward-sloping, but relatively elastic with respect to the nominal wage for given wage expectations by workers. That value of L in turn determines an equilibrium value of R for the given value of P. If we assume that inflation expectations are constant (i.e., that Pe varies in proportion to P), then a given value of P must correspond to a unique value of r. Because simultaneous equilibrium in the markets for capital services and labor services can be represented by unique combinations of P and r, a factor-market equilibrium condition can be represented by a locus of points labeled the FF curve in Figure 1 below. The FF curve must be upward-sloping, because a linear homogenous production function of two scarce factors (i.e., doubling inputs always doubles output) displaying diminishing marginal products in both factors implies that the factors are complementary (i.e., adding more of one factor increases the marginal productivity of the other factor). Because an increase in P increases employment, the marginal product of capital increases, owing to complementarity between the factors, implying that R must increase by more than P. An increase in the price level, P, is therefore associated with an increase in the market interest rate r.
Beyond the positive slope of the FF curve, Thompson makes a further argument about the position of the FF curve, trying to establish that the FF curve must intersect the horizontal (P) axis at a positive price level as the nominal interest rate goes to 0. The point of establishing that the FF curve intersects the horizontal axis at a positive value of r is to set up a further argument about the stability of the model’s equilibrium. I find that argument problematic. But discussion of stability issues are better left for a future post. Corresponding to the FF curve, it is straightforward to derive another curve, closely analogous to the Keynesian LM curve, with which to complete a graphical solution of the model. The two LM curves are not the same, Thompson’s LM curve being constructed in terms of the nominal interest rate and the price level rather than in terms of nominal interest rate and nominal income, as is the Keynesian LM curve. The switch in axes allows Thompson to construct two versions of his LM curve. In the conventional case, a fixed nominal quantity of non-interest-bearing money being determined exogenously by the monetary authority, increasing price levels imply a corresponding increase in the nominal demand for money. Thus, with a fixed nominal quantity of money, as the price level rises the nominal interest rate must rise to reduce the quantity of money demanded to match the nominal quantity exogenously determined. This version of the LM curve is shown in Figure 2. A second version of the LM curve can be constructed corresponding to Thompson’s characterization of the classical model of a competitively supplied interest-bearing money supply convertible into commodities at a fixed exchange rate (i.e., a gold standard except that with only one output money is convertible into output in general not one of many commodities). The quantity of money competitively supplied by the banking system would equal the quantity of money demanded at the price level determined by convertibility between money and output. Because money in the classical model pays competitive interest, changes in the nominal rate of interest do not affect the quantity of money demanded. Thus, the LM curve in the classical case is a vertical line corresponding to the price level determined by the convertibility of money into output. The classical LM curve is shown in Figure 3. The full solution of the model (in the conventional case) is represented graphically by the intersection of the FF curve with the LM curve in Figure 4. Note that by applying Walras’s Law, one could draw a CC curve representing equilibrium in the market for commodities (an analogue to the Keynesian IS curve) in the space between the FF and the LM curves and intersecting the two curves precisely at their point of intersection. Thus, Thompson’s reformulation supports Nick Rowe’s conjecture that the IS curve, contrary to the usual derivation, is really upward-sloping. Stock Prices Rose by 5% in Two Weeks – Guess Why? On Wednesday, July 25, the S&P 500 closed at 1337.89. On Wednesday, August 8, the S&P 500 closed at 1402.22, a gain of just under 5%. Care to guess why the market rose? Well, it’s been a while since I’ve mentioned the stock market, but long-time readers of this blog already know that the stock market loves inflation (see here, here, and here), there having been a strong positive correlation between movements in inflation expectations and the direction of the stock market since early 2008, as I showed in my paper “The Fisher Effect Under Deflationary Expectations.” The correlation between inflation expectations and asset values is not a general implication of financial theory, which makes a strong and continuing correlation between inflation expectations and movements in stock prices something of an anomaly, an anomaly that reflects and underscores the dysfunctional state of the US and international economies since 2008, when monetary policy began to exert a deflationary bias even as the economy was sliding into a contraction. Using Bloomberg’s calculations of the breakeven TIPS spread on 1-, 2-, 5-, and 10-year Treasuries between July 25 and August 10, I calculated correlation coefficients between the Bloomberg TIPS spreads at those maturities and the S&P 500 of .764, 915, .906, and .87. Calculating the TIPS spreads on 5- and 10-year constant maturity Treasuries from the Treasury yield curve website, I found correlation coefficients of .904 and .887 between those TIPS spreads and the S&P 500. So the correlations are robust regardless of the specific TIPS spread one uses. 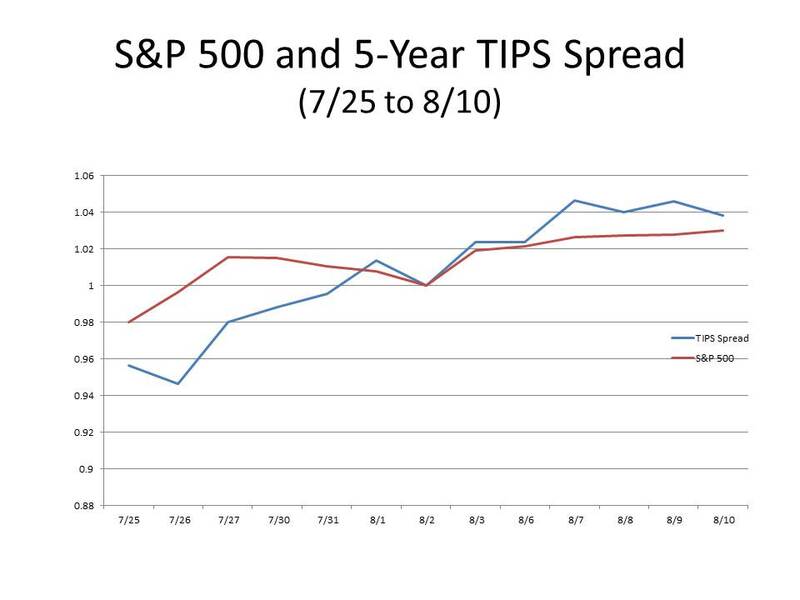 In the chart below, I draw a graph plotting movements in the 5-year TIPS spread (as calculated by Bloomberg) and in the S&P 500 between July 25 and August 10 (with both series normalized to equal 1 on August 2). Ever since March 2009, after the stock market hit bottom, having lost more than 50% of its value in the summer of 2008, the Fed has periodically signaled that it would take aggressive steps to stimulate the economy. The stock market, yearning for inflation, has repeatedly responded to signs that the Fed would respond to its desire for inflation, only to fall back in disappointment after it became clear that the Fed was not going to deliver the inflation that it had earlier dangled enticingly in front of desperate investors. Recently, as the signs of recovery that had been visible in the winter and early spring started to fade, the Fed has been sending out signals — faint and ambiguous, to be sure, but still signals — that it may finally provide some inflationary relief, and the stock market responded predictably and promptly. Will the Fed, perhaps relying on recent favorable employment data as an excuse, once again snooker the market? Stay tuned. In my previous post, I discussed Arthur Laffer’s op-ed in Monday’s Wall Street Journal, in which he argued that a comparison across 34 countries belonging to the OECD showed that the adoption of greater fiscal stimulus in the 2007-09 time period was bigger declines in the rate of economic growth. Laffer argued that this correlation provides conclusive empirical refutation of the Keynesian doctrine that additional government spending can stimulate economic recovery. 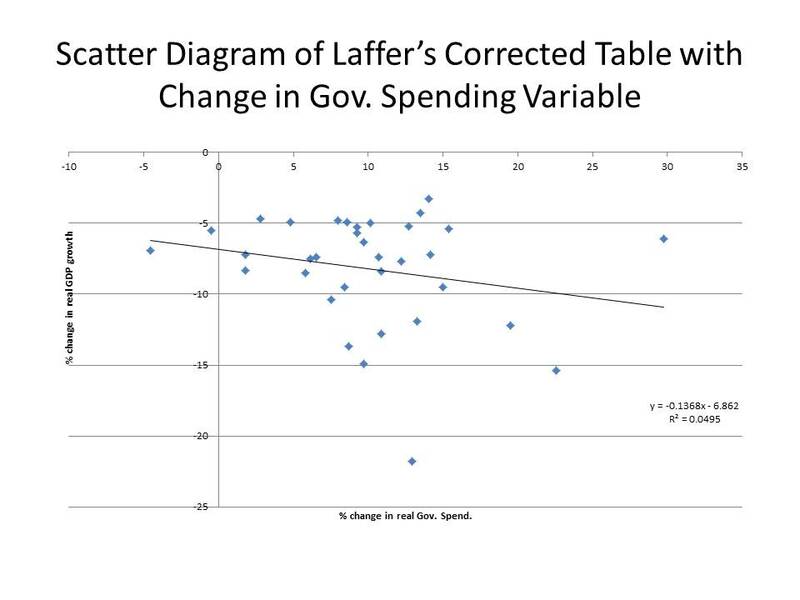 In my earlier post, I complained that Laffer had not explained the meaning of one of the variables — the change in government spending as a percentage of GDP — that he used to make his comparison, and did not provide an adequate source for where his numbers came from, noting that when I tried to calculate the same number using the data on the St. Louis Fed website, I arrived at a substantially smaller value for the US change in government spending as a fraction of GDP than Laffer’s reported. I also observed that the change in government spending as a percentage of GDP can rise not just because of an increase in government spending, but can also rise because of a contraction in total GDP, making the comparison Laffer was purporting to perform invalid, the comparison amounting to no more than a restatement of the truism that countries with bigger contractions in GDP would experience bigger reductions in their rates of growth than countries with smaller reductions in GDP. JR, a diligent commenter to my post, kindly provided me with the source for Laffer’s numbers on the IMF website, confirming that the numbers Laffer used for the change in government spending as a percentage of GDP did indeed reflect the underlying data reported by the IMF. JR was unable to reproduce Laffer’s numbers for the change in real GDP growth, and neither could I. 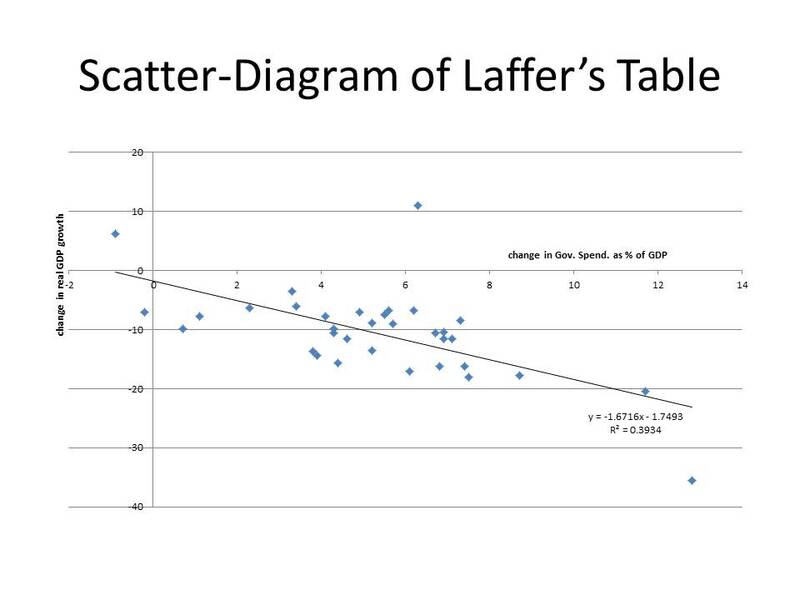 But when I calculated the changes and replaced them in Laffer’s table, I found a similar negative relationship and a better fit (higher r-squared) than shown in Laffer’s table. In either case, the main reason for the negative correlation is that a decrease in real GDP growth is, by definition, correlated with an increase in government spending as a percentage of GDP. So Laffer’s result is pre-ordained by his choice of variables. 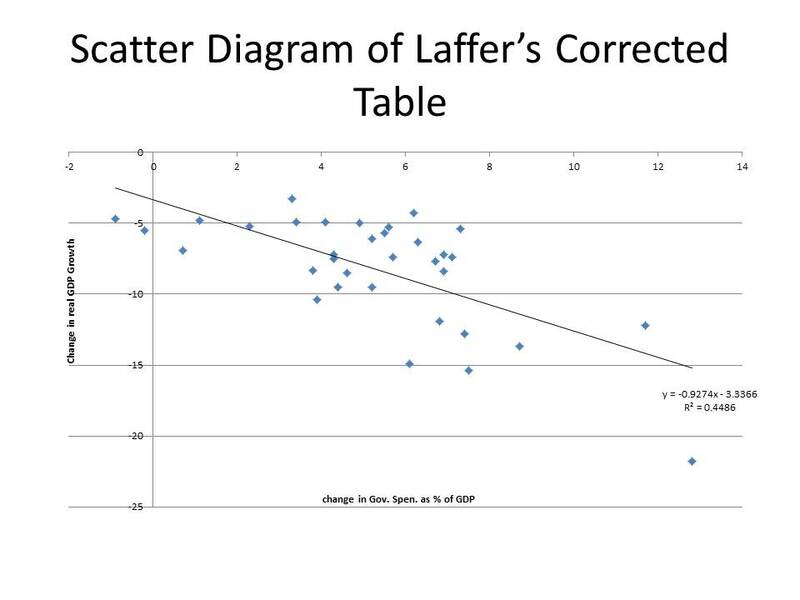 To show what is going on, I provide below two scatter diagrams of Laffer’s table with his numbers and my corrections of the numbers. You can see that the downward slope of the regression line is steeper using his original numbers, but there is less variation around the regression line with the corrected numbers. To see what happens when you eliminate the inherent negative correlation between the change in government spending as a percentage of GDP and the rate of growth of GDP, I recalculated the government spending variable as the real percentage change in GDP between 2007 and 2009. Substituting that redefined variable which is definitionally independent of changes in GDP gives me the following scatter diagram. The slope is still negative, but it is an order of magnitude less than the slope of the regression line implied by Laffer’s numbers. I then tried on further variation which was to replace the change in the growth rate of real GDP between 2007 and 2009 with the change in real GDP between 2007 and 2009. 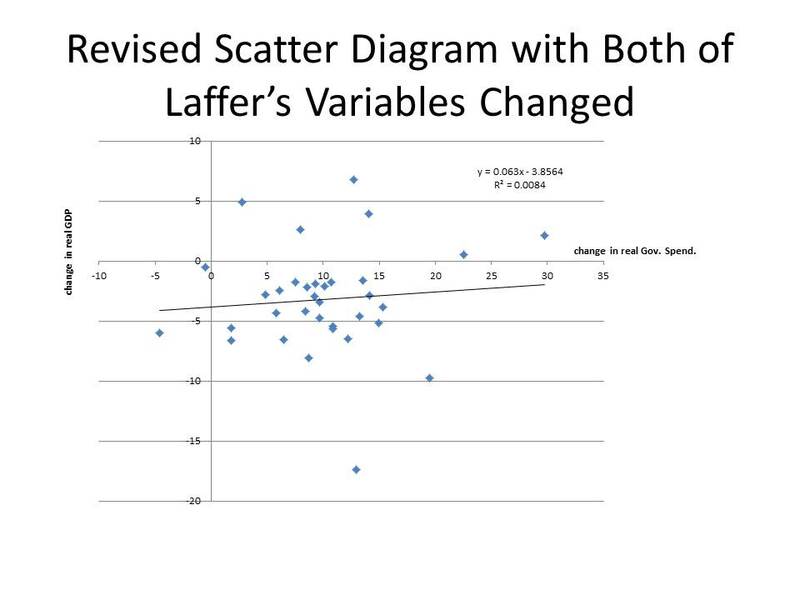 Here is the scatter diagram for corresponding to that change in variables. As you can see, the regression line now has a positive slope, though it is probably statistically insignificant given the very low value of the r-squared. But in view of the simultaneity issues, I mentioned in my previous post, that is hardly surprising. Some readers are probably wondering why I bothered posting all this. I am asking myself the same question, but I just couldn’t help trying to figure out what Professor Laffer was up to. Perhaps this makes it all a bit clearer.